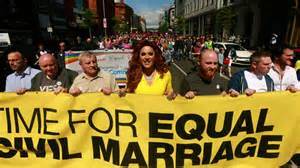 The impact last month’s successful gay marriage referendum in the 26 Counties has spilled over into the 6 Counties, with 10,000 attending a demonstration in Belfast. The fact that the ‘South’ can act as a beacon for the ‘North’ highlights the reactionary nature of the local UK state set-up, which is a barrier to progress in these islands. This article was first posted on the Socialist Democracy (Ireland) blog. On Saturday, 13th June, over ten thousand people gathered in Belfast city to show their support for marriage equality. This demonstration, which was organised by Amnesty International, the Irish Congress of Trade Unions (ICTU) and the Rainbow Project, saw people marching from the Arts College to the City Hall where they were addressed by a number of speakers.